NEWS International acknowledgement to Tunisia : The Nobel Peace Prize 2015 to the National Dialogue Quartet. 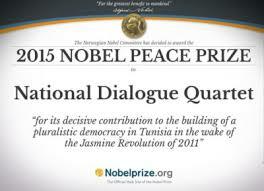 International acknowledgement to Tunisia : The Nobel Peace Prize 2015 to the National Dialogue Quartet. Faster Service has always believed in the professional and human potential of the Tunisian people. We welcome the first acknowledgements and give them all our congratulations for a long continuity of solidarity and growth.